If you are going on a cycling course, ideally you should have a proper road riding bike. This means a proper sized bike that fits you, with gears that helps you to ride for a distance. BMX bikes are very popular at the moment, especially with boys. But remember they aren’t really suitable for riding on the road. If you’re getting a new bike, it’s always a good idea to talk to someone at a bike shop first, about what kind of cycling you are going to do on your bike. Your bike should cleaned and checked regularly for damage. If you are going to leave your bike so you can’t see it, you need to make sure you have a good bike lock with you to make sure someone doesn’t try to steal it. If you have a bike where the wheels can be taken off without a spanner (these are known as ‘quick release’ wheels) you might need two locks. 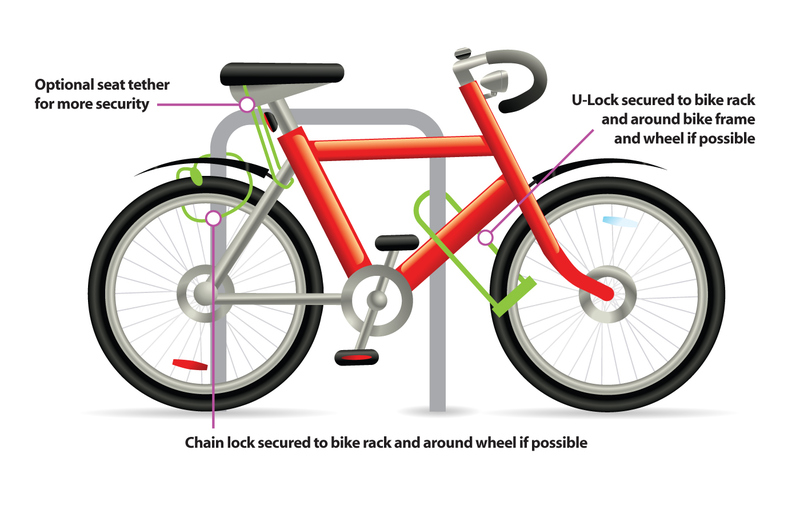 The lock needs to go through each tyre, the bike frame and a bike stand or secure rail or something similar. If the saddle doesn’t need a spanner to remove it (known as a quick release saddle), you can buy a lock for this also. Park your bike carefully so it can’t fall down and people don’t fall over your bike. It’s also a good idea to make sure your bike is registered, so if it is stolen, it can help the police to get your bike to you. Presently we recommend www.bikeregister.com The States Police will provide marking kits FREE of charge and help you mark your bike. You will need to forward security details of your bike to bike register.